My name is Maggie McGuire and I took your class for your new book at Lone Star Quiltworks. I am sending you this picture of my finished quilt top. I am the person on the left and the lady on the right is my Aunt. 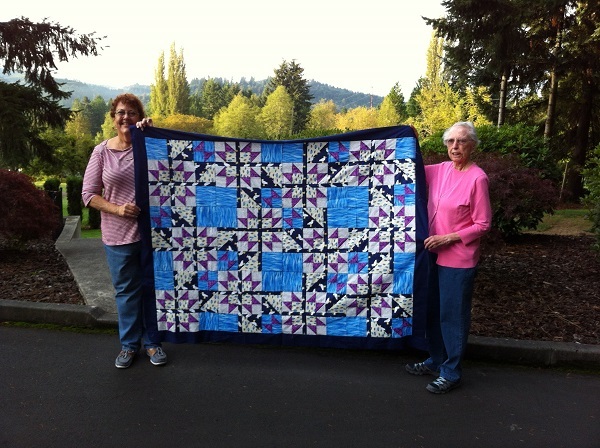 I presented her with the quilt top for her 89th birthday last week while I was visiting her in WA. Sadly, she was diagnosed with brain cancer this Monday and she is in hospice in WA. We bought the fabric when I was visiting her before your class so the whole quilt is a special reminder. So I am back out in WA again and will be here until the end. Just though you should know how your expertise and pattern made an impact in our lives. I plan to have the attached picture put on the back of the quilt in her memory.